Vancouver, BC (April 16, 2018) – On Saturday, thousands of jobseekers descended upon the Vancouver Convention Centre to meet prospective employers from 35 digital entertainment studios and companies. 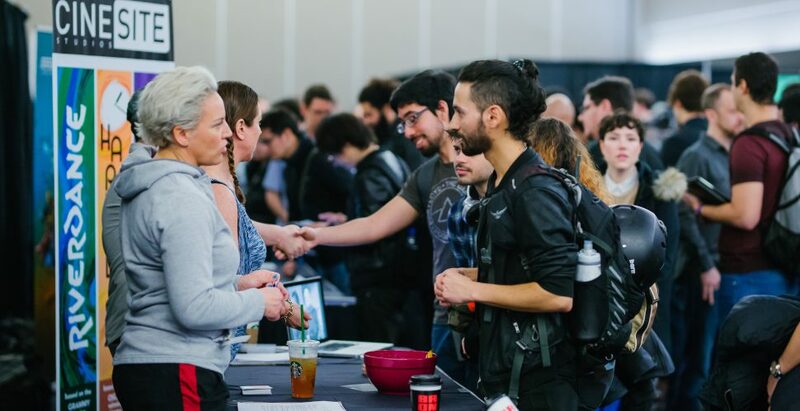 Now in its 7th year, the Vancouver Career Fair for VFX & Animation, Film & TV, and Video Games is the largest dedicated career fair for professionals in this industry. Powered by the Vancouver Economic Commission (VEC) in partnership with NETFLIX, Ernst & Young LLP (EY Canada) and the Province of British Columbia, the Career Fair provided the opportunity to forge valuable relationships and explore job opportunities to sought-after local technicians, artists, design and production management talent. Jobseekers had the opportunity to vie for more than 500 open positions at the studios behind the magic of household names like Star Wars (ILM Vancouver), Avengers: Infinity War (Cinesite), Game of Thrones (Image Engine), FIFA and NHL (Electronic Arts), Rick and Morty (Bardel Entertainment) and several of the Lego Movies (Animal Logic). Also present in greater numbers than last year were rising stars in the virtual reality sector like Archiact and LlamaZOO. The range of exhibiting studios, educational institutions and professional associations provided a clear snapshot of the explosive growth being experienced across all these sectors today. “The Career Fair is a great place to connect with the talent we need for our projects. It provides jobseekers who attend with a lot of value because they are able to have one-on-one conversations with team leads and supervisors,” said Lorraine Rozon, Recruitment Manager at Industrial Light & Magic (ILM). “In addition to showcasing our work and meeting recruitment needs, participating is a good way to engage the whole community.” ILM – one of the world’s leading visual effects providers – has participated in the Career Fair since 2013, when the award-winning studio first opened the doors of its Vancouver office. Over 3,500 jobseekers registered for the career fair – a 40% increase over the previous year. Attendee and exhibitor turnout were both at an all-time high, indicating unprecedented levels of interest in working and hiring in the Digital Entertainment & Interactive industry. VEC staff also found that a substantial proportion of jobseekers had participated in previous years. “By attending the career fair, professionals already working in the sector can build their careers in directions they may not have considered,” said Nancy Basi, Executive Director at the Vancouver Economic Commission, who founded the Career Fair in 2011 with the Visual Effects Society. Attending professionals received warm welcomes from exhibiting studios, many of whom credit the creative and experienced talent in Vancouver as a key contributor to the industry’s success. “At IUGO, our people continue to be our most valuable asset. They are solely responsible for the high level of creativity, skills, and proprietary mobile-specific technologies that have propelled our games into chart-topping titles. As pioneers of the mobile gaming industry, we seek the continued desire to level up our games and people,” said Jera Gunter, Advisor of People Operations at IUGO. “The VEC Career Fair provides IUGO with the opportunity to gain exposure with future IUGO employees that can aid us in not only achieving the above, but who are passionate about seeking unexplored mobile territory to connect us to the next big thing.” Founded 2003, IUGO Mobile Entertainment is the oldest mobile entertainment company in Vancouver and employs over 110 people.